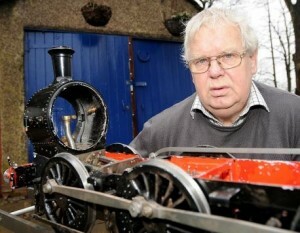 A model rail enthusiast has been left devastated after metal thieves stole the train he had been building for six months. Mr Smith, 70, had spent hundreds of hours recreating a five-foot-long model of a Great Western Dean goods engine. He had almost completed it when raiders forced their way into his garage and stole the miniature steam locomotive for its copper and brass parts. Mr Smith, of Bray Close, Horton Bank Top, Bradford, said: “I started building it last August and must have put 700 or 800 hours work into it.